Find Inspiration. Respect Imperfection. Create Peerless Beauty. What if deep poetry flowed through your day-to-day life? What if writing that poetry was a path to enlightenment? Basho, the grandfather of haiku poetry, named this path, “the Way of Elegance” because it connects you to grace and fills your life with subtle beauty. I began writing Wabi Sabi for Writers, to communicate the significance of this path for writers, but I ended up with a book for anyone who wants the poetic light inside them to penetrate the darkness that surrounds them. Basho knew the central defining quality of his culture was: “a sensitivity to things,” and he deliberately and thoughtfully crafted practices to support and deepen that sensitivity. These practices allowed the quality to expand his life. Unfortunately he found that while “a sensitivity to things” expanded his awareness of beauty it also expanded his awareness of suffering. This heightened awareness of both beauty and suffering leads some people to despair. This is because our capacity to tolerate suffering in those around us seems to decrease as our awareness increases. When faced with an increase in awareness of suffering, many people instinctively turn away from sensitivity and become hardened, detached or distracted. Contrary to this prevailing belief, Basho demonstrated that we can avoid developing hard hearts without practicing non-attachment if, instead, we experience our attachments in a deeper way. Basho’s interpretation of wabi sabi made this possible. 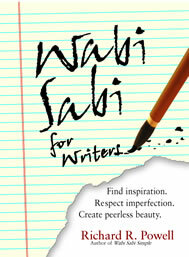 Wabi Sabi for Writers, presents wabi sabi as a balanced set of principles that help a person face into the winds of change, look on the imperfect world with acceptance, and find, mixed within the dark elements of existence, bright strands of joy. Through examples and stories the book illustrates how to expand your sense of beauty until each moment brims with light. One of the key concepts on the way of elegance is “furyu.” Basho discovered in his life of reading and thinking and wandering and teaching and writing that all of these things contributed to Furyu which literally means “in the way of the wind and stream”. It is putting yourself in the traffic, launching yourself into the action, not necessarily as a player, but deliberately, as the eyes and ears and taste buds and sense of smell. Furyu is a powerful tool that shows you what you like, and also what you love. Basho adopted Furyu as his central attitude and orientation and found that it generated inspiration, poetry, and enlightenment. An ancient Japanese word with roots in the Chinese language, Furyu describes a stance or approach that puts a person on the path of elegance. If you would like to learn more about how to develop Furyu in your life, about how to naturalize your creative activities and find transcendence through harmony with nature, then Wabi Sabi for Writers if for you. Richard, I read your book a few years ago and loved it. I was doing a bit a research on wabi sabi and so was inspired to pull it off the shelf again, and am looking forward to re-reading it. Lots to absorb and I feel it may be especially helpful to me at the moment with my writing. Was also glad to find your blog here and your other blog. Looking forward to following! After seeing your comments here I recall that I also received a connection request from you on some other social media platform. I’ve been very delinquent in my review of this site and other electronic media, so I apologize for not responding sooner. I like what you are doing over on terrain.org. Interesting idea. Also really liked your review of Lab Girl. I like the term, ” literary autobiography.” I think that describes what I’m doing right now. Thanks for your comments and your writing!